First, let’s positioned ourselves and stand in the same place as the photographer. In front of us is the intersection of Main Street and Fourth Street. We are looking West in this photograph which tells us that out of sight, but immediately to our left is the Keystone Hotel. On the right, you can see the edge of the curb of the Worth Block, which means the House of Lords is just a quick jaunt around the corner. Second, the Connor Hotel is across the street from us. The Connor Hotel was completed in 1908, so we now have an estimated time as to when we are standing at the intersection of Fourth and Main. If you look closely, you will recognize some of the stonework that is now outside the Joplin Public Library. When you look down the street from the Connor, you will notice a row of small buildings. 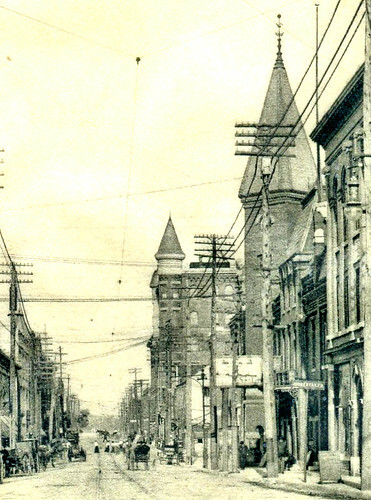 These buildings were eventually demolished to make way for the Connor Annex, which was built in the 1920’s. 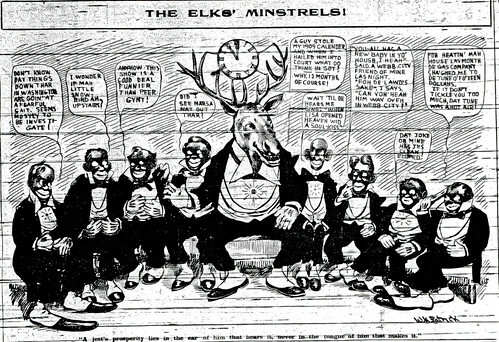 Again, we have now created a time span for when we are looking: 1908 to 1920’s. Third, beyond the small buildings, you will notice a tall building. Gone now, but only a few years old at the time of this photograph, the Miners Bank Building was home not only to the aforementioned bank, but also to one of Joplin’s premier architects, August Michaelis. If you squint, on the opposite side of the street framed by telephone and power lines, is a steeple. That steeple belongs to another of Joplin’s lost buildings, the Club Theater. It was home to the Joplin Commercial Club, which survives today in the form of the Joplin Area Chamber of Commerce. Fourth, immediately across from the Connor is a two storm frame building. 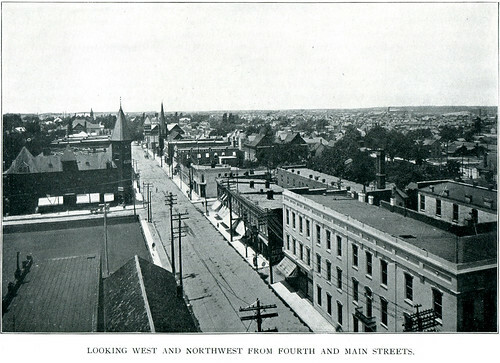 Until it was destroyed to make way for the Liberty Building (and current resident of the southwest corner of Fourth and Main), this was the oldest remaining building in Joplin at the time having been built in the 1870s. Fifth, also of note, are of course the the trolleys and if you look close at the street, you can see a textured surface. 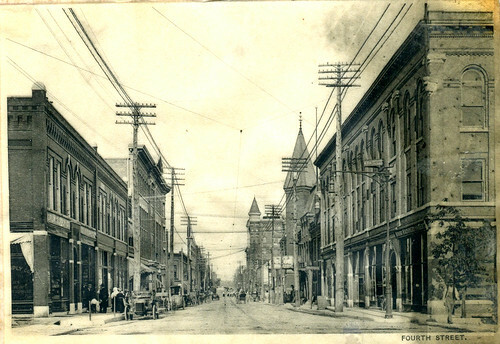 Reportedly, these were macadam streets, which Joplin boasted of having many and might still exist in some form under her currently paved streets. Almost a year ago, we brought you the history of the Club Theater which once stood at the intersection of 4th and Joplin Street. Recent research has uncovered what we believe may be the only surviving exterior side view, or Joplin Street view of the Club Theater. Of course, we have to share! 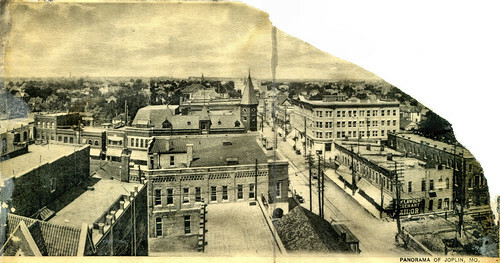 The image appears to be an architectural drawing for the building, which was constructed in 1891. Note the drawing appears to be the work of a Kansas City firm. Most images of the theater that do exist show the building either looking at it from the entrance presented above on the right side of the drawing, or of its Fourth Street exterior. Below is an example of the former. Photograph of the Club Theater taken some time before 1902. By all appearances, it seems there was no real deviation at first glance from the drawing to the building. As noted in our prior post, the last remnant of the Club Theater vanished after a fire in 2003. 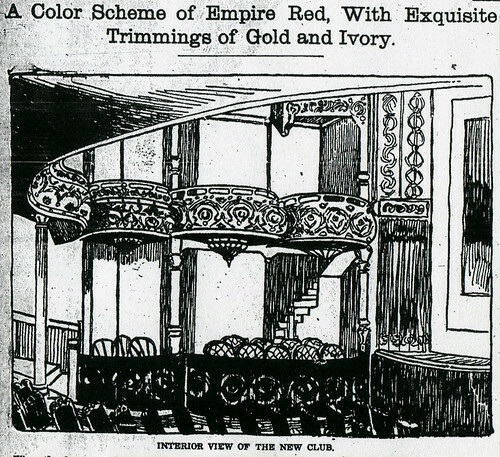 When the Club Theater was renovated in 1902, the interior was trumpeted as a “color scheme of Empire Red, with Exquisite Trimmings of Gold and Ivory.” The theater, originally built in 1891, stood watch at the intersection of Fourth and Joplin Streets. After its renovation it was commonly referred to as the New Club Theater. 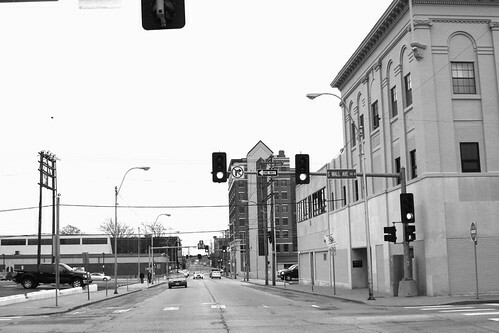 The idea for its construction originated as a meeting place for Joplin’s business and social elite. The Joplin Club, formed in 1889, was comprised of Joplin’s most influential and powerful citizens. They were civic minded men who were inspired to promote and improve Joplin. 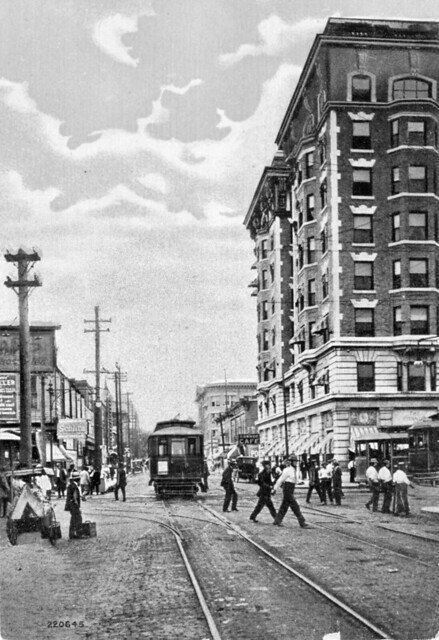 The club members played a key role in the construction of the Keystone Hotel in the early 1890’s, the finest lodging in the city until it was eclipsed by the Connor Hotel which opened in 1908. Once a week Joplin’s captains of commerce, men like German born brewer Charles Schifferdecker and real estate mogul Thomas Connor, met to discuss the future of Joplin. Members of the club realized two things. First, the club needed a proper meeting place to hold their gatherings. Second, and most importantly, they realized that Joplin lacked what they believed every up and coming city needed, a first class theater. Intent on building a clubhouse for the betterment of Joplin, the club purchased lot located a block west of the center of city’s commercial heart at Joplin and Fourth Streets. The lot was reportedly purchased at a price of over five thousand dollars (though this may have included cost of construction). 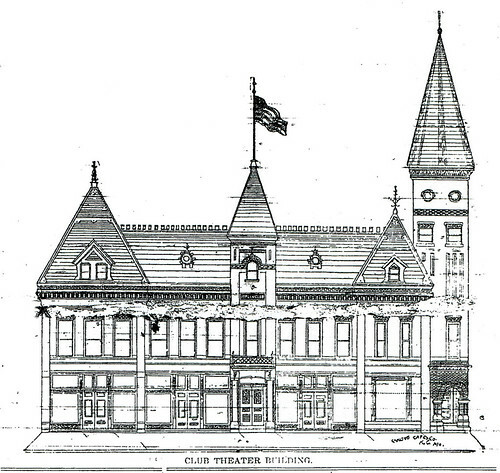 On January 26, 1891, the Club Theater formally opened. It boasted seating for 1,400 patrons in a theater situated in on the west side of the building along Joplin Street. A painted scene of local landmark Grand Falls adorned the stage curtain. On the north side of the second floor was an area reserved for the Joplin Club to host its formal and informal functions and meetings. This area may have consisted of two grand rooms. 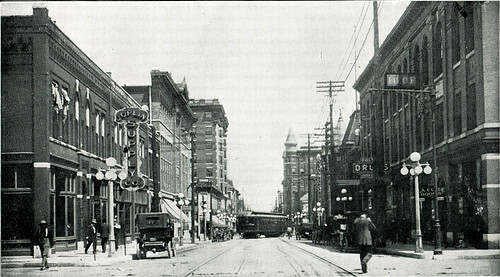 This photograph likely taken prior to 1902, the Club Theater is the steepled building on the right. The Keystone Hotel at Fourth and Main Street is just down the block with the conical roof. The first production to grace the stage of the theater was Shakespeare’s King Henry VIII. Centuries before, when Shakespeare’s Globe Theater had produced the play, an accident during the show had resulted in a fire that burned the theater to the ground. Tragically, the Club Theater would later suffer a similar fate. 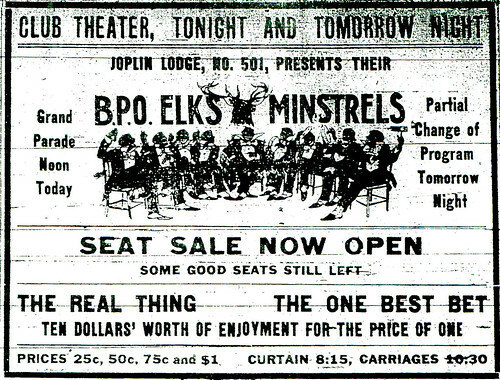 The clubhouse section of the theater was formally dedicated on March 4th, 1891, with Joplin’s finest in attendance. It was a scene of well-dressed gentlemen sipping spirits and filling the air with the rich aroma of Havana’s finest. Speakers included the head of the Joplin Club, W.H. Picher, who spoke and then read from a letter sent to the Joplin Club from Governor David Francis. The next to speak was the Honorable Gabriel Schmuck, who had traveled from Galena, Kansas, and then a local judge, O.H. Picher. Other speakers, from nearby Carthage, Webb City, and Neosho all spoke of the prominence and promise of Joplin. 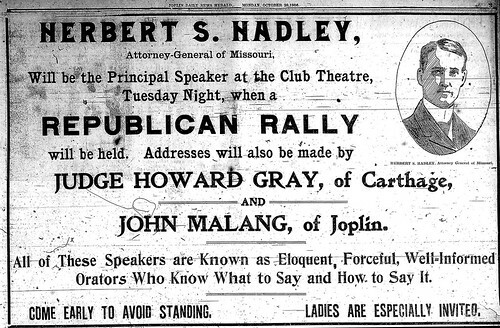 An ad for Attorney General Herbert Hadley is evidence of the powerful and important figures who the Club Theater hosted in its heyday. Eleven years later, wear and tear had taken its toll upon the Club Theater. 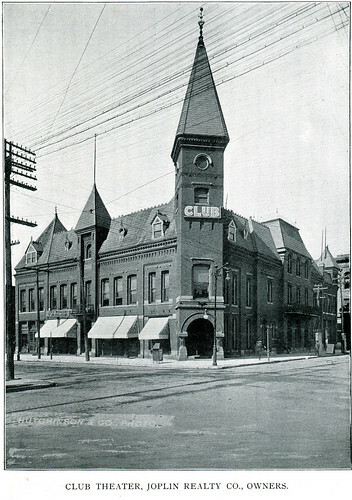 By this time the Joplin Club had sold its interest in the theater to other investors, and renovations were begun in August, 1902 at a reported cost of at least $15,000. Period newspapers claimed the newly refurbished theater had no equal in the great state of Missouri with the exception of perhaps the Willis Wood Theater in Kansas City. Renovation work had taken three months to complete. Workers replaced stained and worn panels with new panels of empire red and ivory wainscoting trimmed with gold. Gold and ivory were also used to dazzling effect throughout the interior in the ornamentation of the boxes, gallery and balcony fronts. For the wealthy, eight boxes were available as well as six loges. All were carpeted with plush red velvet. The same lush carpeting extended to the gallery floor for the enjoyment of those of more modest means. The stage was expanded to a size of forty-five by sixty-five feet, with an arch overhead complete with a sounding board painted a soft blue and decorated with white clouds and branching red roses. The stage even had the capability to expand even greater to allow for the production of the most modern and elaborate plays or musicals. Of the men in charge, only one was a local to Joplin, Don W. Stuart. Stuart had worked at the theater under its previous management. The other three were essentially absentee owners, C.U. Philley from St. Joseph, L.M. 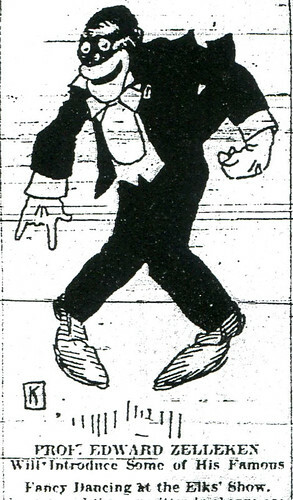 Crawford of Topeka, Kansas, and F.C. Zehrung of Lincoln, Nebraska. All three men were involved in the entertainment business. For another six years, the New Club Theater was the premiere venue in Joplin, attracting operas, minstrel shows, and famous conductors as they swept across the nation entertaining Americans with the music of a new century. In that time, the theater charged anywhere from ten to thirty cents for admission. 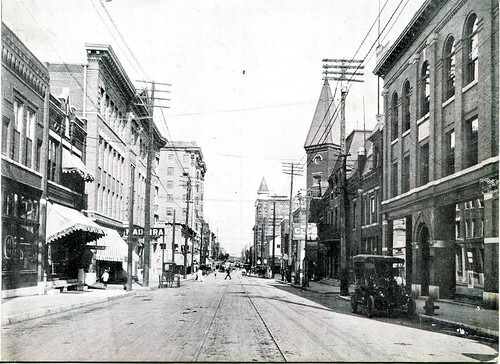 However, in 1908, the Shubert Theater opened several blocks away, and assumed the position as the premier theater of the city of Joplin. All that was left to the New Club Theater was the low brow amusements of vaudeville and memories of the great operatic performers and productions. An implicit indication of this loss of status was the absence of the New Club Theater in a promotional photo booklet put out by the city of Joplin in 1913, where as the theater had been included in a 1902 version of this booklet. 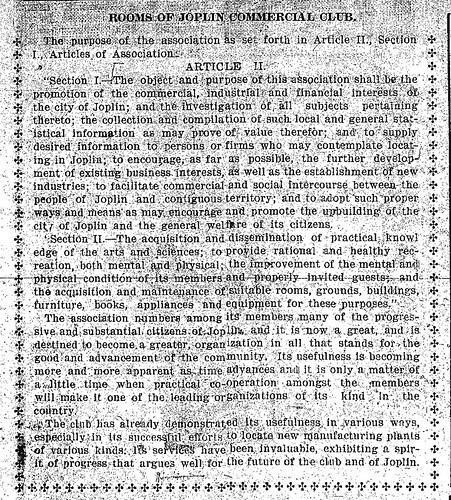 By 1906, the Joplin Club had moved out of the premise and the Joplin Commercial Club placed an ad in the local paper describing its value and place in Joplin society. (For easier to read version just click on image). Ten years following the opening of the Shubert, in 1918, the theater portion of the building burned and was never replaced. What remained of the New Club Theater continued on regardless, eventually being remodeled as an office building. A fire struck again in 1939, but the building persevered, but ultimately was unable to escape a fiery fate when in 2003 a grease fire from a restaurant located within brought the once proud building down to ashes. Today only a parking lot remains. Sources: History of Jasper County by Joel Thomas Livingston, Missouri Digital Heritage, and the Joplin Daily Globe.